Another week – and another rebuttal letter published as a full page feature in Sri Lankan newspaper The Island. Wonder how long I can keep this up for . . .
Gamini Gunawardene’s comments on my most recent response to your correspondent Shamindra Ferdinando (The Island, 5 April 2016) have been brought to my attention. I don’t propose to respond on every issue he raises, just those that relate directly to my earlier reply – Gunawardene’s scattershot historical assertions are probably best left to others to address. Gunawardene begins by wondering why the Norwegians singled out the majority Sinhala community for assistance in efforts to build up a ‘peace constituency’ – and concludes by taking this fact as evidence that their basic assumptions were ‘flawed’. The answer is that – correctly in my view – the Norwegians identified securing Sinhala support for the Ceasefire Agreement (CFA) as absolutely essential to the future prospects for the peace process initiated with the CFA’s signature in April 2002. This view was based on the straightforward proposition that any sustainable peace agreement in Sri Lanka requires the backing of the country’s majority population group – the Sinhalese. Regarding the overall lesson learned that, as Gunawardene quotes me as saying, ‘external support for peace can never be substituted for locally owned and initiated efforts’, he draws two demonstrably false conclusions. First, it is not the case that, as he infers, this ‘lesson’ never occurred to the Norwegians until much later in the day: the question of supporting the emergence of a local ‘peace constituency’ was in fact a subject of lively debate among not only Norwegians, but also other internationals working in Sri Lanka and–last but not least – their local partners from at least the mid-1990s, and probably earlier. Second, it is simply false to suggest that the Norwegians failed to pay sufficient attention to previous attempts at external intervention/mediation– notably India’s and the lessons to be drawn from them. 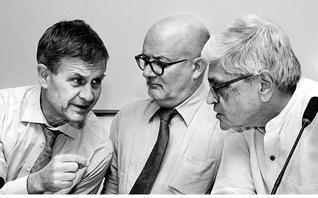 As Erik Solheim and others involved at the time never tire of pointing out, close consultation with Delhi was a cornerstone of Norwegian peace facilitation efforts in Sri Lanka. The issue then, I believe, is not one of familiarity with, for example, the ultimately disastrous IPKF intervention, but rather of the right conclusions to be drawn from it. As the main argument of Gunawardene’s piece makes plain, supporters of a military ‘solution’ to the conflict in Sri Lanka, such as himself, never tire of pointing to a range of incidents during the conflict’s course as ‘evidence’ of the futility of ‘appeasing’ the LTTE, the impossibility of reaching any agreement with them and thus the necessity of destroying the Tigers by force. Those who framed and supported the CFA examined precisely the same evidence as Gunawardene et al. However, they draw very different conclusions from it, the central one being that after over 15 years of conflict, the futility, human and economic cost of continuing with the war pointed clearly to the imperative of redoubling efforts to achieve a peaceful end to the conflict. Nor were the Norwegians alone in thinking in this manner. In early 2002 they shared this starting point (or a close variant of it) with many others, notably the key architects of the CFA: Ranil Wickremesinghe and his newly elected government and the LTTE leadership. All in all, then, it is simply false to contend, as Gunawardene does repeatedly, that the Norwegians had not ‘studied’ the Sri Lankan conflict, or had failed to understand the lessons of past interventions. No: the point was simply that they, like many others, came to the conclusion that a peaceful solution to the conflict was both desirable and – based on the good will of both parties apparent at the time – perhaps possible. Gunawardene goes on to question my reference to Chandrika Kumaratunga’s proud recollection of the achievements of the Sudu Nelum movement. ‘So when the Sinhalese supported, was peace ushered’? he asks, somewhat sarcastically. No, not in 1998 is of course the answer. But three years later, a majority voted in Wickremesinghe’s UNP government, which proceeded swiftly to agree a ceasefire with the LTTE and only four months later, to conclude the CFA with them. And even if the margin was pretty thin, opinion polls conducted soon after the CFA indicated majority support for the agreement. This suggests that, all in all, efforts to secure popular support for peace in the majority Sinhala community were both sensible – and feasible. (The suggestion towards the end of Gunawardene’s article that in positing a post-CFA need to ‘explain and advocate the benefits of peace’ to sections of the Sinhalese community I am contradicting myself here is spurious. Sinhala attitudes are not a fixed asset, and much had shifted between the mid-1990s and the early 2000s, public opinion with respect to peace efforts included). Following this comes Gunawardene’s dissection of what he calls my ‘foolish assertion’ that when Norway peace facilitators entered the scene in Sri Lanka they shared the widely held view that ‘neither side was capable of defeating the other militarily’. He goes on to deride the ‘superficiality’ of this perception. But hold on there! First, I am offering a statement of fact here, not a judgement. Fact because, it is unquestionably the case that this represented majority perception –at this point; including significant sections of the Sri Lankan political and military establishment. Second, this is a perception that appears to have been maintained by significant actors in Sri Lanka until a good deal later in the conflict. As noted in my last reply, for example, Erik Solheim relates an incident in autumn 2008 when a senior Indian official informed him that he believed that Sri Lankan forces were now capable of defeating the LTTE militarily as the first time he had heard a high-level Delhi representative express that opinion. Hardly evidence that, as Gunawardene argues, this viewpoint was ‘a ‘popular misconception created by ‘the West’ (sic)’. All in all, in describing the Norwegian view as ‘superficial’ and as an explanation for the fact that their ‘peace effort’ (his ironic inverted commas) ‘miserably failed’, Gunawardene is condemning as ignorant a much wider audience than he perhaps intended. In similar vein, he goes on to pose the rhetorical question: what if they [i.e. the Norwegians] did not [support and facilitate the peace process]? Would that have been the end of the world for us?’ The answer to that, I sense, is ‘almost certainly not’. With, however, one important rider; namely, that the one and only reason the Norwegians agreed to act as peace facilitators in Sri Lanka was because they were asked to do so by the parties. It’s important to reiterate this basic point, if only to counteract the continuing tendency – traces of which are evident in this intervention – to ignore or otherwise downplay the fact that Norwegian involvement in the conflict was the result, not of external interference and/or a post-imperial breach of Sri Lankan sovereignty, but of a request to do so by the Sri Lankan government and the LTTE. Coming to Gunawardene’s rousing if cheapshot conclusion. If it is indeed the case that, as he suggests, a fundamental lesson from Sri Lanka is ‘not to mess around with other people’s troubles’, then the people who may most need to take that lesson to heart are those who invited the Norwegians in, in the first place. If you talk to those people, however – as I have done– you will discover that they extended the invitation to Norway following considerably more thought and reflection than Gunawardene appears to credit them with. And they did so, moreover, in the apparent belief that the invitees were a good deal more level-headed – and well-informed about Sri Lankan affairs – than he appears to believe was the case. All of which leaves his parting swipe at the Norwegians – ‘especially when you are incompetent’ – looking even more questionable, if not absurd, than it already was.